This application is based solely on rainfall data and the resulting Combined Sewer Outfall prediction models established, and does not reflect realtime dry-weather discharges or actions taken by DEP in emergency events. Please check DEP homepage for any additional advisory information. Combined Sewer Overflows (CSOs) happen when a wastewater treatment plant or parts of the sewer get too full, usually when there’s a big rain event or snowstorm. When this occurs, wastewater is sent straight into our waterways, without being treated. 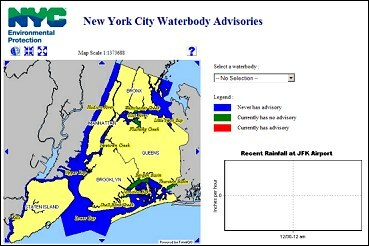 DEP supplies an online Waterbody advisory application to see how rainfall has impacted NYC Waterways. A combined sewer system is a sewer system where wastewater and rainwater are collected in the same sewers and then conveyed together to the city's treatment plants. During heavy rains or snow, combined sewers can fill to capacity and are unable to carry the combined sanitary and storm sewage to the plants. When this occurs, the mix of excess storm water and untreated sewage flows directly into the city's waterways. Why is there such concern with combined sewer overflows? These overflows are a concern because they can increase the number of harmful bacteria and pollutants being released into our open waters. They can also carry trash and litter from the streets. Because of this the city has a comprehensive plan to reduce CSOs. DEP has a broad citywide effort to better manage stormwater using a variety of innovative, sustainable green infrastructure. Green infrastructure, or source controls, are a set of techniques that detain or retain stormwater runoff through capture and controlled release, infiltration into the ground, vegetative uptake and evapotranspiration thereby reducing the need for end-of-pipe stormwater storage and treatment systems. This helps reduce the likelihood and intensity of combined sewer overflows.